(Nanowerk News) The efficiency of plastic solar cells can be doubled or tripled if an extra solvent is added during the production process, comparable with the role of baking powder in dough mixture. Exactly how this works has been unclear for the last ten years. But now researchers at TU/e have come up with the answer in a publication in Nature Communications ("A real-time study of the benefits of co-solvents in polymer solar cell processing"). This new understanding will now enable focused development of plastic solar cells. Plastic solar cells, also referred to as organic solar cells, use polymers instead of the usual silicon to convert the energy from sunlight into electricity. The use of plastic as basic material reduces the cost and weight of these solar cells, and makes them flexible. But their efficiency of around 10 percent still remains below that of commercial silicon solar cells, which reach efficiencies of between 15 and 20 percent. It was known that there was a connection with the ‘morphology’ of the solar cell, in other words the exact structure of two mixed plastic components in the cell between which electrons move under the influence of sunlight. These components – both of them organic materials – are dissolved during the production process, after which they evaporate and harden. The mysterious co-solvent is always added to the solvent before evaporation. The Eindhoven researchers led by René Janssen used a combination of optical technologies to find a definitive explanation. They say that if they did not add a co-solvent, they found that large droplets were formed during the hardening of the plastic mixture. These have an adverse effect on the electron transport – and as a result on the efficiency of the solar cell. “The more co-solvent you add to the solution, the smaller the bubbles turn out to be, until they disappear completely when a specific content is reached”, says Janssen. They also found the reason for that. “There are two effects that arise during the hardening process”, says Janssen. 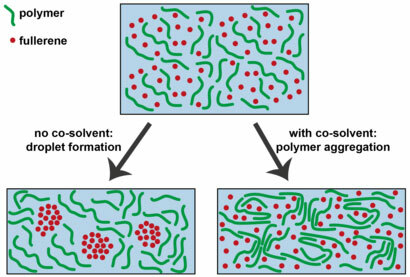 “On the one hand the solution evaporates, and as well as that polymers take on a ‘folded’ structure. We saw that the co-solvent makes this ‘folding’ process start at a much earlier stage, which means the bubbles are ultimately no longer formed at all.” In this way the co-solvent acts as a kind of ‘baking powder’: it improves the structure of the mixture, but the agent in itself is not enough.